Lionel Messi's sensational header which sealed Barca's victory in Rome and in a sense started the Era of Golden generation. 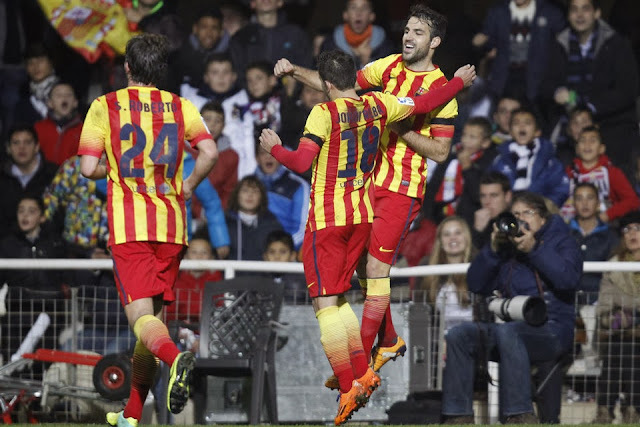 FC Barcelona staged a sensational comeback after going down 2-0 early in the first half. Pedro's sensational hat-trick and two goals from Cesc Fabregas scripted a 5-2 victory which keeps at the top of the table going into Christmas break. FC Barcelona has been drawn to face Manchester City in the Round of 16 of UEFA Champions League 2013-14 Season. Of all the possible opponent we got the most difficult one, especially considering that Manchester City has successfully managed to change their fortunes on the road. I would have definitely preferred as Olympiakos, but that went for Manchester United. Our English Premier League Opponent lie currently in fourth but it's their home form which terrifies me. They have scored 35 goals and conceded only 5 goals at The Etihad this season. The away form has been pretty bad compared to their home, even though the recent victory against Bayern shows that they are slowly turning that around too. In that back drop the first leg which will be held at The Etihad on the 18th of February become the vital fixture in deciding the tie. 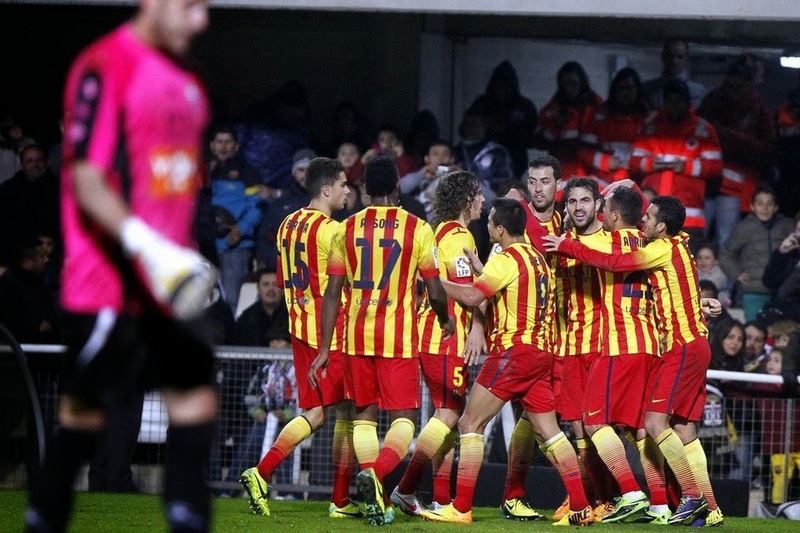 Full highlights video from last night's 2-1 victory against Villareal. All goals from tonight's Barca's victory over Villareal. 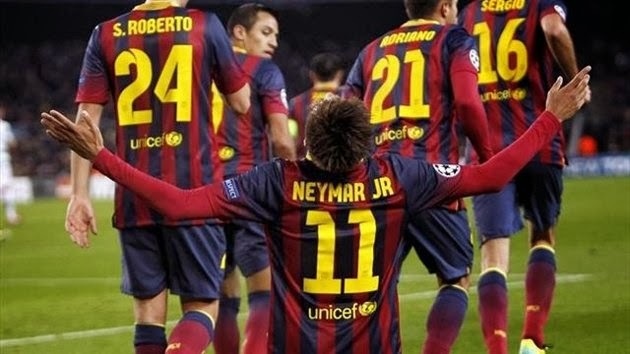 Neymar scored twice at the Camp Nou to take Barca to a deserving 2-1 victory over a hard working Villareal side. In a matter of three days Neymar was once again the Master on the Pitch, enthralling the fans, harassing the opponent and most importantly scoring the goals. In the end he had to consider himself pretty unlucky not to have completed his hat trick tonight. With Real Madrid dropping points today this hard fought victory could prove vital especially when the season reaches the end. After the success of Neymar in a Messi role in mid week, Martino took him back to his favorite left flank with Cesc Fabregas playing the false 9. Alexis Sanchez made the rest of the attack. Busquets, Iniesta and Song made up the midfield. Pique, Montoya, Bartra and Alba formed the defense in front of Pinto. Whom would you want Barca to meet in Next Round in UEFA Champions League? The final list of participants in this season's Champions League is decided and we do have a prospect of some tough and tricky fixtures. 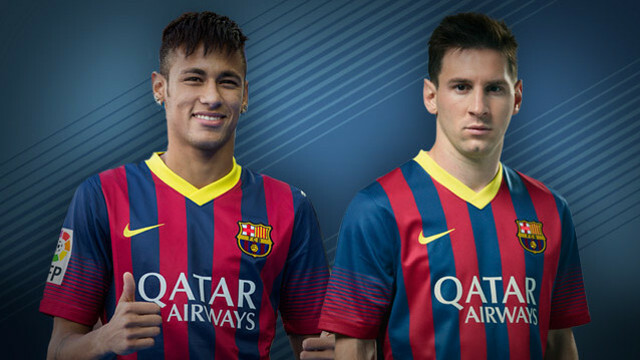 By topping the group, Barca has made sure that they won't have to meet any other fellow Group toppers. Even then there might be some teams which we would dearly love to avoid in the next round. The biggest for me is Manchester City who in the last few matches looks like getting things fine even on the road. Their defeat of Bayern Munich in Germany would have made them the best one to be avoided. The next big one which everyone would love to avoid will be Arsenal, who are on the top of Premier League table right now. The big surprise of the Group stage has to be the exit of Juventus courtesy of Galatasaray. Neymar really likes to torment defenders, he is how he does it usually. 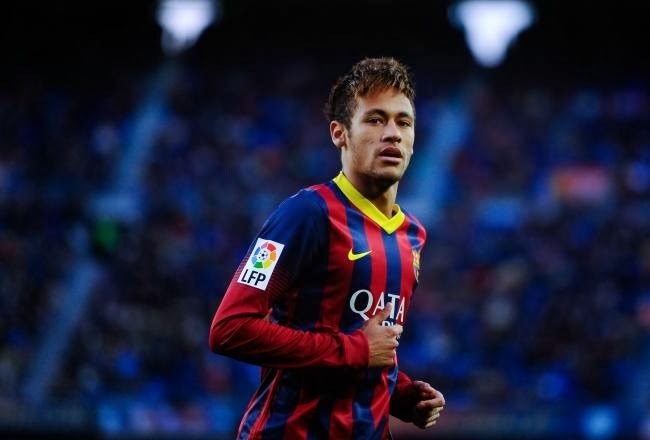 A brilliantly worked goal finished excellently by Neymar for Barca against Celtic. 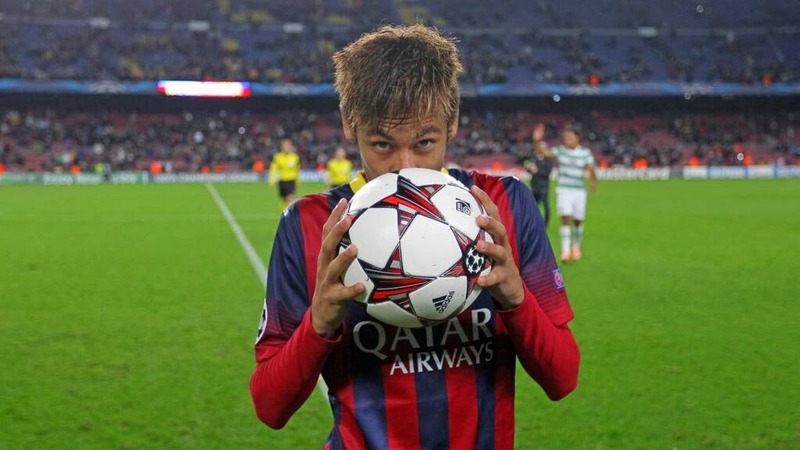 Brilliant hat-trick from Neymar helped Barca thrash Celtic at home in a 6-1 victory. Courtesy to the victory we comfortably top Group H.
Another GIF of Lionel Messi's unbelievable run into the box against Athletic Bilbao, needless to say was hacked down. The fact that he was not awarded a penalty for that still baffles everyone. When Group H schedule was first announced, I was dead sure that this match would be nothing more than a practice game for Barca and crunch game for Celtic. How wrong I was? Tonight when we host Celtic at the Camp Nou, Celtic got nothing to lose, they are already out of the Group and their away supporters are banned from attending this match. But FCBarcelona's situation is a bit different. We have already qualified for the Group stage but the defeat against Ajax in Netherlands means we need to secure at least a point from this match to top the Group. If we lose and then Milan win against Ajax then we will be dropping to second position; in contrast an Ajax win should not affect our standing unless they over come the goal difference. A lot of people disagreed when I called out Group as the Group of Death (Barca drawn in to Group of Death) along with Group F. Now it looks like it was, even though it can't rival the drama of Group F.
Lionel Messi's amazing run against Atletico Madrid. When he sets off like that there is only one way to stop him - foul him; they did exactly that. Highlights from Barca B's 2-0 victory over Sabadell. Looks like the B Team is finally coming back to form. Is the goal celebration a serious poke at Sandro Rosell, it resembles Abidal's Celebration? Is Pedro trying to send a message? Or are we just reading too much in to it! Cesc Fabregas excellent finish against Cartagena to give Barca the lead. 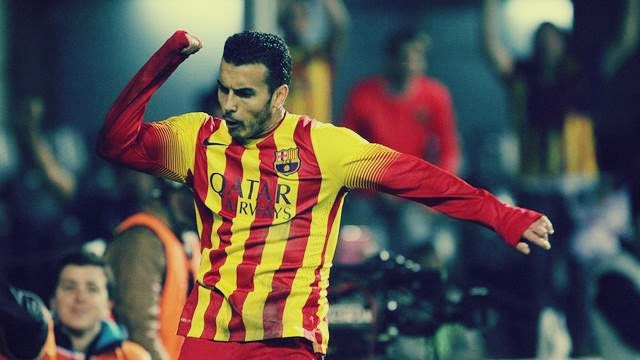 Pedro Rodriguez briliant finish against Cartagena which put Barca 3-1 ahead. The finish was excellent so was the pass from Alexis Sanchez. Lionel Messi's Argentina have it much easier than many of his Club colleagues in the Group stage of 2014 World Cup to be held in Brazil. The draw which completed tonight threw up some rather interesting groups, also some seriously tough ones. Messi's Spanish friend's could be jealous at his luck after Argentina was paired with Nigeria, Bosnia and Iran in Group F. Meanwhile Spain were handed a really tough test having to face Netherlands in a rematch of 2010 World Cup final in their opening match. Spain also has Chile and Australia in their Group. Dealing with Chile in South American conditions could be a real head-ache for the Dutch and Spaniards. So that makes the Group B really interesting. 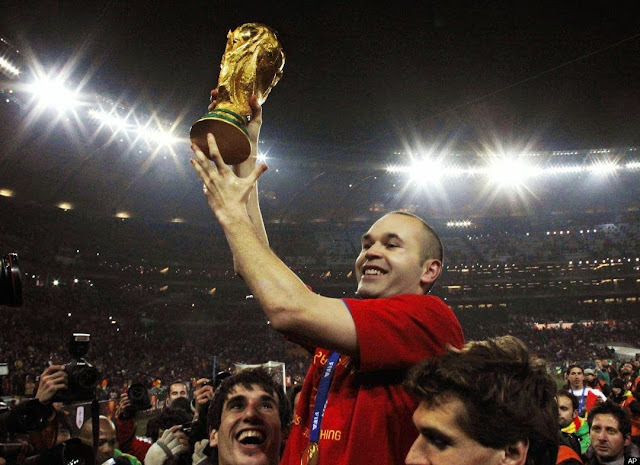 Iniesta's trademark elastic skill is a treat to watch. The easiness with which he does make it look unreal. 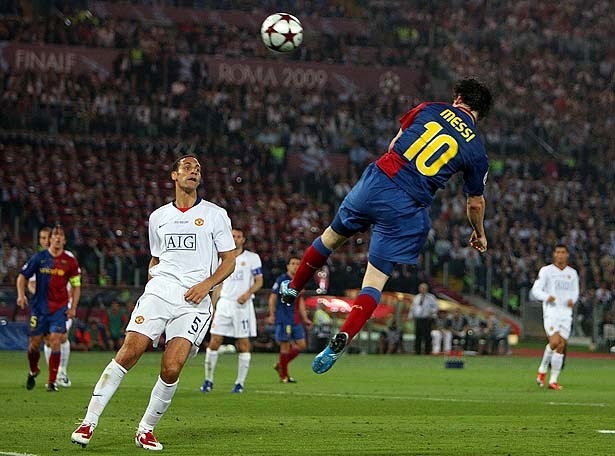 There is no doubt that Lionel Messi produces his best against Arsenal(Check out this - another Messi vs Arsenal Goal). His record shows it. This goal shows why Arsenal manager, Arsene Wenger considers Lionel Messi as "The Best Player Ever"
This is How we could fix the FIFA BALLON D’OR voting Mess! FIFA Ballon d’Or has been mired in many controversies, there is no stoppage this time around. A small change in the voting method will make the process efficient and proper. "Controversy equalizes fools and wise men - and the fools know it. - Oliver Holmes "
F IFA is no stranger to controversy! Everything they does ends up in controversy. Some years back they decided to find the "Best Player of the Century", hope none of you haven't forgotten the controversy it created. FIFA's intention could not have been doubted, but the method they employed definitely landed them in soup; that too in a matter which always was very controversial in footballing circles. Learning from their mistakes is something FIFA hates to do and they seldom do. So they continued with their time-honoured fashion of creating one controversy after the other. The controversy surrounding Ballon d'Or is the latest in a series of unfortunate events (Check out the Odds on this year's Ballon d'Or winner at football coupons). Having the "King of Fools" ,Sepp Blatter at the helm definitely helps in achieving the job faster. Now Sepp Blatter is no fool, he is just acting as one. Is Barca's season taking a turn for the Worse? "Failure is not fatal, but failure to change might be. - John Wooden "
How fast time changes? Last week we were talking about the possibility of this Barca side emulating the "Arsenal Invincibles"; right now we all have our favourite word on our mouth "THE CRISIS". Now, we jumping on to the word Crisis may not be a big thing, we tend to go for that at the drop of the ball. But this time around it may not be us over reacting, but we may have a bit of crisis in there. May not be anything to shatter the whole season; but not heeding to these warning definitely could end the season in tears! Barca lost their unbeaten start to the La Liga season after going down 1-0 at San Mames. Without Messi we looked really below our par, even though the performance was better than what we saw against Ajax. Now in a space of week we have lost twice! Time for Martino to get the boys back on track! Martin Montoya heading out of Barca? Martin Montoya, the young Barca right back could be on his way out this summer; if reports emerging from Barcelona has to be believed. Yesterday MundoDeportivo broke the story of the contract renewal talks braking down completely. If the latest rumours are to be believed, then Liverpool is very much interested in the player and is even ready for a January summer purchase. Their MD Ian Ayre will reach Barcelona on Thursday to open talks on the possible transfer. If this is true then we will be losing yet another young talent. The worst part is that we have identified him as the future of Barca defense but still couldn't hold on to him. An awful Barca went down to Ajax at the Amsterdam Arena courtesy of two first half goals from a young Ajax team. The defending at display by Barca players were shambolic and that led to the two goals. Just have a look at what transpired. Lionel Messi last night presented the Golden Show which he won for being the leading goalscorer in Europe to the Camp Nou faithfuls. 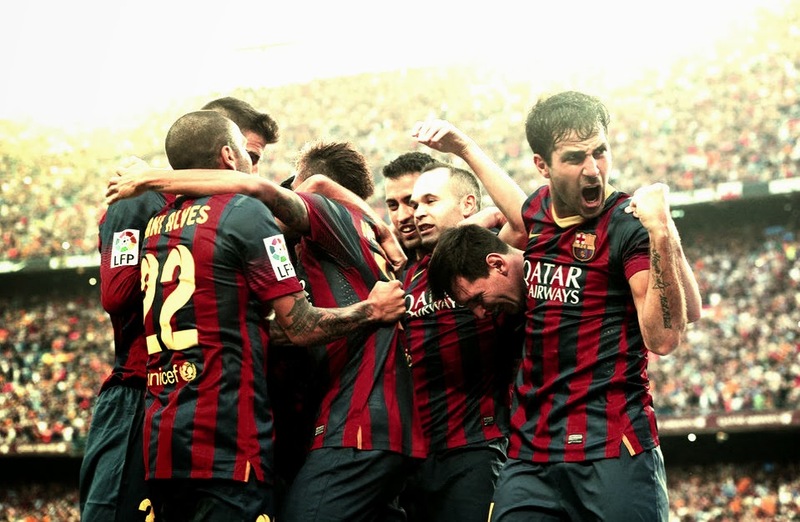 To make the moment more wonderful, the team obliged with a near perfect 4-0 drubbing of Granada. 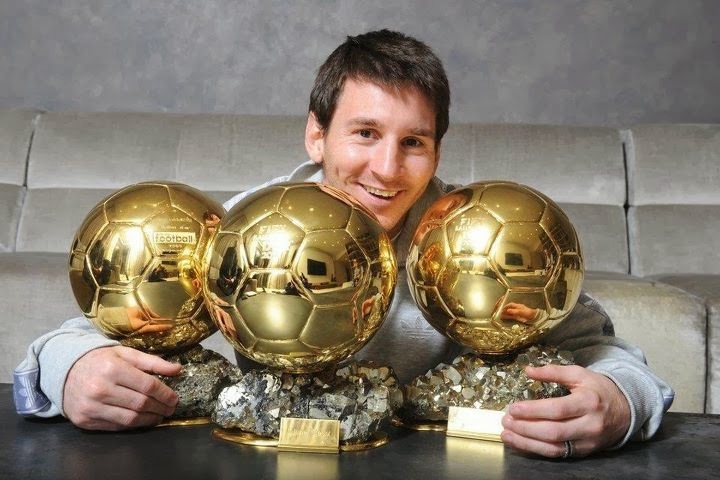 In an interview given to De Telegraaf, Lionel Messi reiterated his wish to continue at Barca and possibly retire here. "Once is happenstance. Twice is coincidence. Three times is enemy action. - Ian Fleming"
This has to be more than coincidence. I mean how can it happen again? 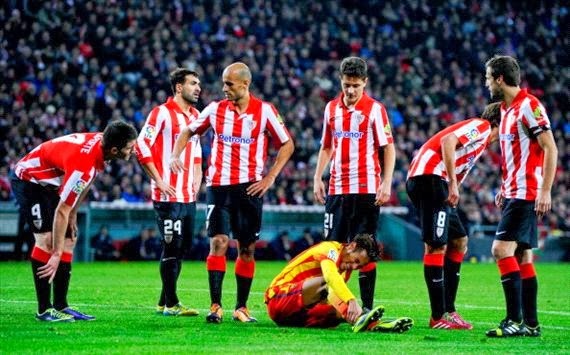 Are we seeing a repeat of Barca's injury crisis imploding? "Imploding" is the right word as any aggravation from this moment could take us with it. May be I am just being a normal Cule - the one who start to panic at the mere mention of the word injury. What troubles me most is the amount of muscle injury our players are picking up this season. May be we are all simply seeing too much into these. In the end as Lionel said it could be all down to bad luck. Then it doesn't hurt anyone to analyse whether there are any more reasons. FC Barcelona is set to miss out on the service of Victor Valdes for a period of three to six weeks after picking up a calf injury in last night friendly. Valdes, who is easily Barca's best player on the pitch since the start of the season tore his calf muscle after starting the second half against South Africa. The game ended with a surprising defeat for the defending world champions. With Valdes missing our porous defense could be tested really badly in the coming weeks. Barca looking to sign Berbatov in January? Dimitar Berbatov looks to have entered into Barca manager's back up plan for finding cover for Messi. 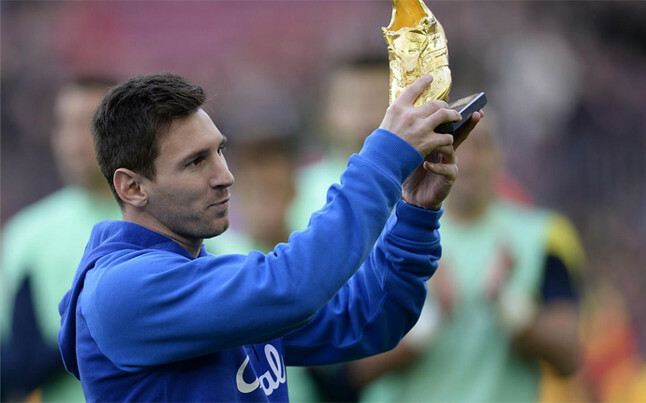 Lionel Messi could make a comeback in late January, but Martino does not want to rush his star player back. Instead it is reported that he is looking to sign a center forward in the Winter transfer window. One should remember that Martino since the time he has joined the club has always voiced the idea of signing a center forward. There were many linked but it looks like the Argentinian manager is keen on Berbatov due to his experience, link up play, availability in Champions League and also above all his price. He is expected to come cheap considering the alternatives. Lionel Messi is already known for him amazing dribbling runs. After Diego Maradona, he could be the one who mesmerises people whenever he dances past defenders as if they were not there. So it's all add up to this. There will be a football match in some sort of simulated space like environment and our own Lionel Messi will lead the team. To those who are absolutely clueless about what I am talking! Here is the answer. You remember the strangely dressed(alien like dressed) guys seen in Chelsea, Bayern matches. And you also might have seen Franz Beckenbauer's video explaining the threat posed to the Earth by Aliens. It was clear from the start that it was a brilliant marketing ploy by some company, now it's becoming clear who was the perpetrator. It Samsung and the marketing extravaganza is for their highly successful Galaxy series of products. Now what all we know - there will be a football match! Our team will be led by Lionel Messi! The rest of the players will be announced later. It's seriously getting exciting. Only one question - Since Messi is leading the charge against Aliens, who will Real Madrid support? The big question on everyone's mind is whether Pedro gets the assist also for this Goal! 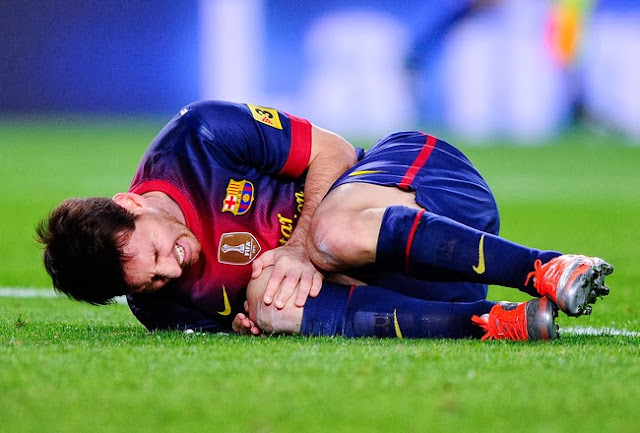 Lionel Messi's injury has been confirmed and like all fans feared it will result in a bit lengthy lay-off. The club medical staff has confirmed that Messi will be out for six to eight weeks due to a torn hamstring muscle in his left thigh. This is the third injury he has picked up this season and should end all his hope of retaining the Balon d'Or this season. The two earlier injuries suffered on his right leg and now it's the left leg which is in trouble. You can find a video of Messi with fans following the injury. High Definition full highlights from last night La Liga encounter between FC Barcelona and Real betis. FC Barcelona continued their unbeaten start to the season with a 4-1 victory against Real Betis. The match came with it's own injury crisis with Messi picking up yet another injury, this time on the left leg. This yet another injury in a season which has been marred with continous breaks. 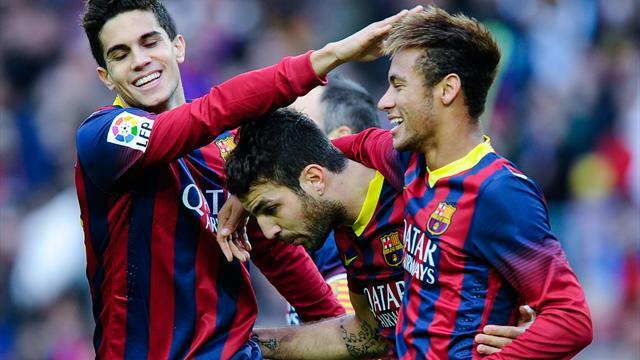 Cesc Fabregas scored twice and One Goal each from Neymar and Pedro gave us a comfortable win. FC Barcelona videos featuring brilliant skills. Two goals from Lionel Messi and one from Sergio Busquets gave Barca a comfortable victory against the Italian Giants AC Milan. Pique's own goal, created by Kaak gave Milan some consolation from the trip to Camp Nou. With this victory Barca has sealed their place in the next round of UEFA Champions Legaue 2013-14. "Genius, is the capacity to see ten things where the ordinary man sees one. - Ezra Pound"
When FC Barcelona step out tonight to face AC Milan at the Camp Nou, there will be more attention spread on Lionel Messi's individual performance than team's. That's the price Lionel Messi had to pay for being a Genius in an ordinary World. By his own standards Lionel Messi is going through a crisis of enormous proportion (so says the Press). It's been three match since Lionel Messi has officially found the back of net, something of a rarity nowadays. Barca coach has officially declared that he is getting tired of answering questions regarding Messi's form; so everyone expect a big answer from the little Argentinian tonight. Is Lionel Messi playing poorly? That's a question no one is ready to answer in this whole drama going on. Without any doubt Neymar was the best Barca player on the pitch. Every move which mattered went through him and it was no surprise to see him open up the tough Espanyol defense. Full Highlights Video from Yesternight's Catalan derby between FC Barcelona and Espanyol. A sole Alexis Sanchez goal created by Neymar gave Barca the three points. With this victory Barca continue their undefeated start to the season. Marc-André ter Stegen to replace Victor Valdes? As per German Sport Newspaper "Bild", FC Barcelona has reached a pre-contract agreement with Borussia Mönchengladbach keeper Marc-André ter Stegen. Marc-André ter Stegen has been under Barca managements radar the moment Victor Valdes announced his intentions of leaving the club. Even though the club is still trying to retain Valdes' service, especially after his series of recent heroics. The chances of that happening is pretty slim as Valdes has ruled out extending his stay. There has been a host of goal keepers who has been linked with Barca recently, the last being Ben Foster. But Marc-André ter Stegen was always in prime position being the firm favorite of Sporting Director, Andoni Zubizarreta. Neymar got first first taste of "El Clasico" tonight and is still licking his lips with treat served by him. Everyone expected him to be overawed by the atmosphere that only a clash between Real Madrid and FC Barcelona, but someone forgot to tell him all that. Neymar's first clasico was the best match he has played in a Barca shirt so far. He scored on and created the other to round off a brilliant individual night. Martino went with the best eleven available to him. The first eleven had Valdes, Alves, Pique, Mascherano, Adriano, Busquets, Iniesta, Xavi, Cesc, Messi and Neymar. The bench featured Pinto, Montoya, Puyol, Song, Pedro, Alexis and Sergi Roberto. Real Madrid went with more or less expected line-up - Lopez, Carvajal, Varane, Pepe, Marcelo, Ramos, Modric, Khedira, Bale, Ronaldo, and Di Maria. Ramos was deployed as a midfield enforcer. A brilliant Lionel Messi goal secured Barca with a precious away point at san Siro. Full Match Highlights from last night clash against Celtic. Cesc Fabregas well taken goal proved to be the difference between the two sides. A lone Cesc Fabregas goal gave Barca a deserved victory against Celtic.